In early December we went to the small town of Chaiya Phum in North East Thailand. Chaiya Phum has a great night bazaar that has heaps of food, clothing stalls and live music. It seemed to be a very busy place and felt like all the locals had come out to enjoy the atmosphere. 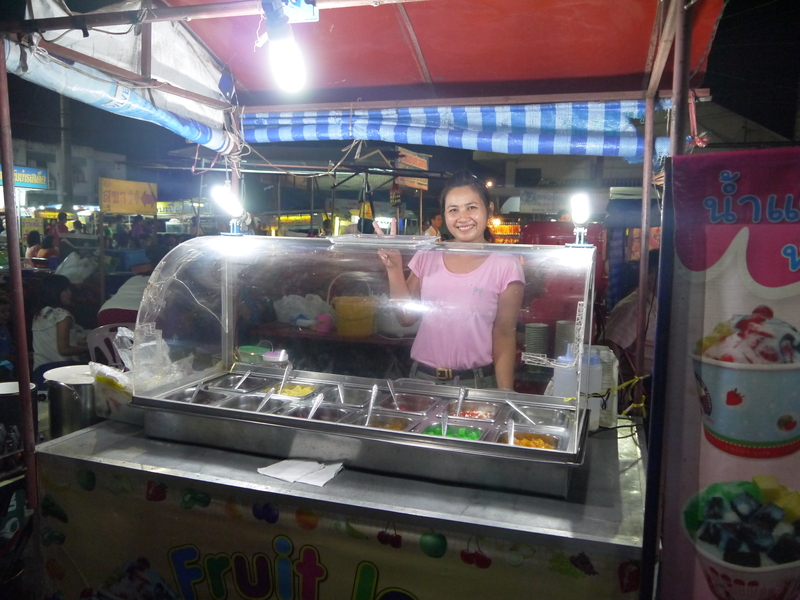 We had some quite good food at the night bazaar, but our favourite was the shaved ice dessert. Known as Nam Kang Sai in Thailand, it’s a delicious blend of finely shaved ice topped with condense milk or coconut milk and your selection of sweets. I can’t really tell you what toppings I chose as I only recognized the pineapple and jube lollies. But the woman at the stall was very helpful and encouraging so I got the random ones and they were delicious. 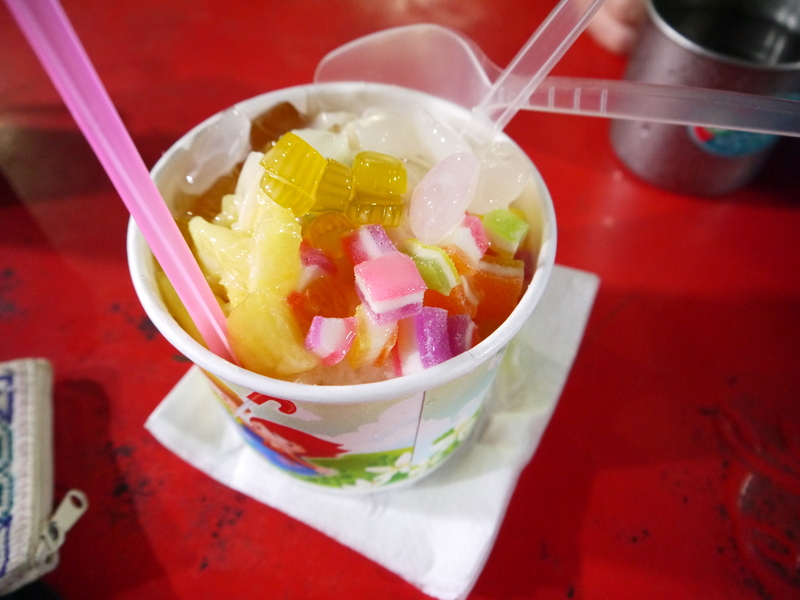 Shaved ice desserts are quite common all around the world. 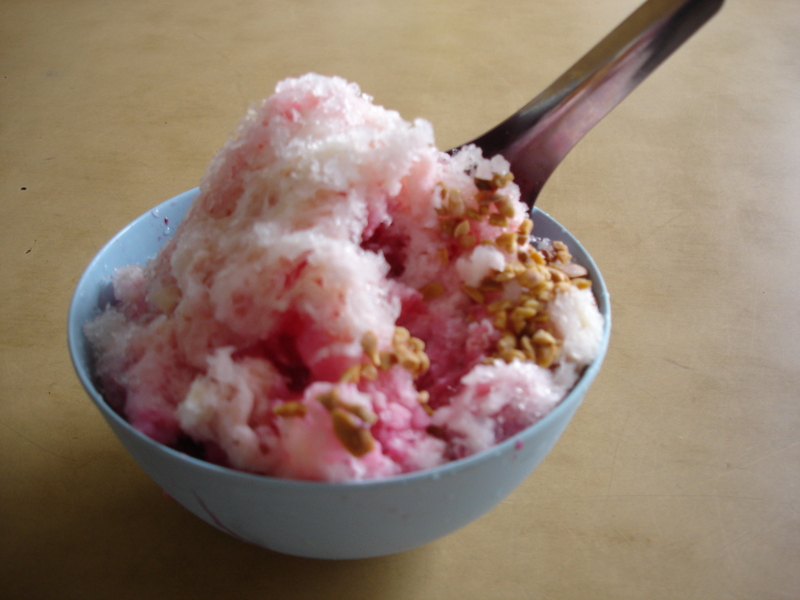 We’ve had some really delicious ones in Malaysia and Indonesia (known as Ais Kacang), I especially liked the ones with beans. In the past the idea of a shaved ice dessert was rather unappealing – I found it hard to imagine how you could make a dessert with ice that wasn’t ice cream. My other thought was that surely it would just melt really fast in the hot climate, and you’d just end up with a bowl of cold water with sweets inside. I think partly these thoughts were influenced by my idea of shaved ice in New Zealand, where it is served at fairs and kids get it loaded with syrup flavouring and that didn’t interest me at all. But what I’ve repeatedly found is that it is a dessert that is very refreshing, it doesn’t melt all that fast, and when it does it just mixes in with all the toppings and is just as delicious.